The House of Representatives passed the massive ($584 billion) FY 2015 Defense Reauthorization Bill. Of that money, $1.8 billion (fully funded) will go to continuing research and development for the next generation ballistic missile submarine to replace the current Trident (OHIO Class) fleet. Rep. Joe Courtney, D-2nd District and a member of the House Armed Services Committee, says (among other things) that this bill "strengthens our economy in Eastern Connecticut." Of course, what Courtney avoids talking about is the huge risk to the U.S. economy, and in fact the global economy, from any use of nuclear weapons. 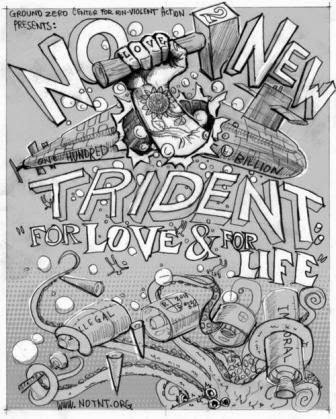 Building a new generation of Trident as well as other new nuclear weapons systems practically guarantees a future in which at some point these horrific weapons will be used. At that point, all bets are off. Depending on scope of use as well as the geographic area(s) directly and indirectly affected, regional economies and the global economy will be affected. 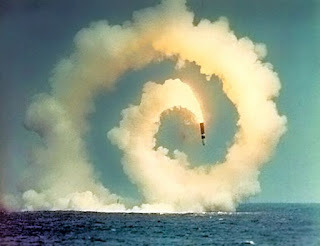 But we should digress for a moment from economic factors, which so many supporters (particularly those in Congress) like to cite in pushing new nuclear weapons systems. Beyond the economic devastation of even a limited nuclear war, the effects on the environment that sustains civilization will be unimaginable. Among them will likely be limited or total collapse of civilization as we know it. If our members of Congress truly represent the people, they need to think beyond short term economic stimulus for their districts and begin to look at the long-term good of the people who (we hope) will be here after we have gone (hopefully leaving things a little better rather than much worse). Think about that as you read the following article announcing this past week's House vote. What are our priorities??? Electric Boat's multi-billion dollar contract for the continued construction of Virginia-class submarines was approved by the U.S. House Thursday as part of a $584 billion defense reauthorization bill, winning praise from regional economic development officials and the state's congressional delegation. The measure, which sailed through the House on a 300-119 vote, heads to the Senate next week where it is expected to be approved. Highlights of the bill include the authorization of $5.9 billion for the Virginia class submarine program, including $3.6 billion for two boats in 2015. The measure also fully supports the Block IV multi-year submarine contract completed earlier this year, which calls for 10 submarines to be built over the next five years. A $1.3 billion budgetary request to continue research and development of the Ohio class ballistic missile submarine replacement is also included in the bill, as is $133 million for the continued development of the Virginia class payload module. And, if the Senate adopts the legislateon in its current form, there would be no base realignment and closure round in 2017. Chris Zendan, a spokesman for the Naval submarine base in Groton, said Thursday the Navy doesn’t comment on pending legislation. U.S. Sen. Richard Blumenthal, D-Conn. said he is ready to support the bill in the Senate. John Beauregard, executive director of the Franklin-based Eastern Connecticut Workforce Investment Board, said keeping the region’s military sector operating at existing levels helps stabilize an economy that has been gaining traction in recent months.